You may think we are referring to online streaming giant Netflix with its $44BN market cap. But Netflix is just the beginning for next generation online content streaming. It’s all down to one tech company that is set to list on the ASX via an imminent reverse takeover. Of course this company is not Netflix... yet... and is a speculative investment as the acquisition still needs to be finalised. Of the 180+ streaming platforms operating in the market today, this company has developed one of the most advanced platforms available. This platform allows for content to be streamed in an encrypted format from its currently operational Kuala Lumpur Hub Station. This company is selling its online streaming platform not to consumers, but large business like telcos, governments and large media organisations – it’s a wholesale streaming provider. There is a global piracy epidemic in full flight, and the Hollywood Studios see this secure delivery capability as a key differential for their content distribution to the emerging market regions. As a cloud based multi-device television service provider, this company can offer the latest in cutting edge television and Hollywood blockbusters, international content, Xbox and PlayStation games, plus Karaoke to a global audience. This is just the beginning really, as this company plans to bolt on a ‘managed contribution’ channel – This is set to be similar to YouTube but with content that is vetted for quality, with links to users social media accounts. Another reason businesses are so intrigued by this company’s technology, is the competitive edge it will give them in the race to attract advertisers. The blue sky element of this platform is the real time analytics capabilities. This company can offer real time analytics to its clients – allowing them to display richly targeted advertising to consumers – also in real time. This company’s clients are prepared to spend big bucks being privy to valuable live audience insight, something they can on sell to advertisers. This company’s clients can monetise broadcasts of video, audio, gaming and music content via the Internet to their users, over any network, to any device. It has enormous potential selling to businesses in a market in which Netflix alone has 60 million subscribers globally, but can reach so many more people throughout the world. Galicia Energy (ASX:GAL) is now just days away from finalising the acquisition of TV2U – a pioneer in innovative content streaming and analytics technologies with reach across into North America and the worlds emerging markets. GAL identified TV2U as a reverse take-over target primarily for the potential for imminent, large-scale commercial applications of its technology. In order to position the company to attract institutional and sophisticated investors, GAL is currently undergoing a 2 for 1 consolidation of shares. The effective date for this consolidation will be Wednesday 11 November, with the issue date forecast for 20 November. Last day of trading for the re-organised shares is 10 November. The number of shares on issue before the re-organisation was 762,247,323. This will in effect halve, however the value of the shares will double. The company is to be reinstated to the ASX and trading as TV2U on November 23. With the current minimum subscription of $4M, TV2U is expected to be fully funded through to revenue generation. If GAL can successfully raise $10M, this will accelerate construction of important head end infrastructure for TV2U. At the same time, investing in GAL is speculative – there is no absolute guarantee the cash will be raised and the acquisition finalised – in any case we will find out in the coming weeks. Let’s go through exactly what GAL plan to acquire via the acquisition of TV2U. TV2U’s key product offering is TARA. TARA is a managed cloud entertainment platform that can uniquely identify each individual subscriber, their viewing habits and the device they’re using. TARA enables operators to introduce an on-demand content service for the first time, either under the TARA brand or as a white-labelled product. TV2U CEO Nick Fitzgerald describes TARA as a “future Facebook for entertainment”. Where competitors such as Netflix offer a straight streaming service, TARA can create personalised channels based on everything from bird watching to skateboarding. This will be further enhanced with the delivery of a managed content contribution channel whereby anybody with an interest in bird watching or skateboarding can upload content to the TARA server, have it verified for production quality and suitability for broadcast and provide that content for viewing among likeminded communities via a video on demand channel. Essentially, TARA provides channels for user-generated content where viewers can make their own content available across the network and searchable by other users. The strength of this platform that it will generate a high volume of user generated content currently proving popular amongst TV viewers. This is where TARA truly becomes the Facebook for watchable content. Further to this TARA has entered into an agreement with Sunfly Karaoke Limited, a premier karaoke label that has had a well-established global presence since 1991. Could you imagine Netflix providing a Karaoke service? I didn’t think so. Sunfly will provide TARA the rights to use digital content consisting of karaoke songs and accompanying music videos. TV2U will embed this content into its “Jukebox” audio/video Karaoke application, that will enable songs to be downloaded on demand and be used across multiple networks and any consumer devices offered to subscribers. Then there is the Pay-Per-View experience where the content is rented for a limited period and can be watched repeatedly for a limited time. This model is usually used with Hollywood content offerings. This goes hand in hand with a subscription VoD (video on demand) experience where end users can watch content from a constantly updated library. For instance, TV series that have daily episodes can be leveraged so that users pay a subscription fee for back catalogue episodes while being able to watch the latest daily episode on the live channel. Finally TV2U intends to develop relationships with casinos and betting companies to extend its technology to include support for live sports betting. This line of development will enable users to watch live sports from around the globe and be able to place bets on the outcome. 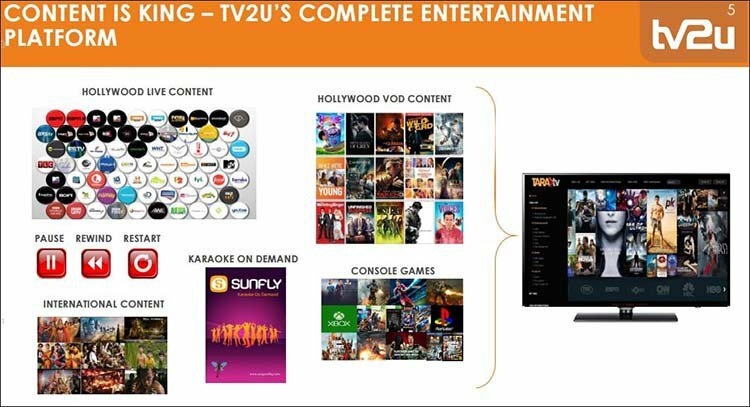 TV2U is effectively offering a holistic entertainment platform with everything from Hollywood blockbusters to Karaoke and sports betting all at your fingertips, which opens up several doors for all important revenue growth. The TARA platform allows its operators (TV2U’s clients) to monetise online video content from the entire value chain – installation, delivery, subscription, maintenance, advertising, and content. Clients can push up their revenues through detailed analytics, push advertising that commands premium advertising fees and create strong encryption protocols and piracy controls that attracts content providers including large ISPs that don’t want to fall prey to piracy. 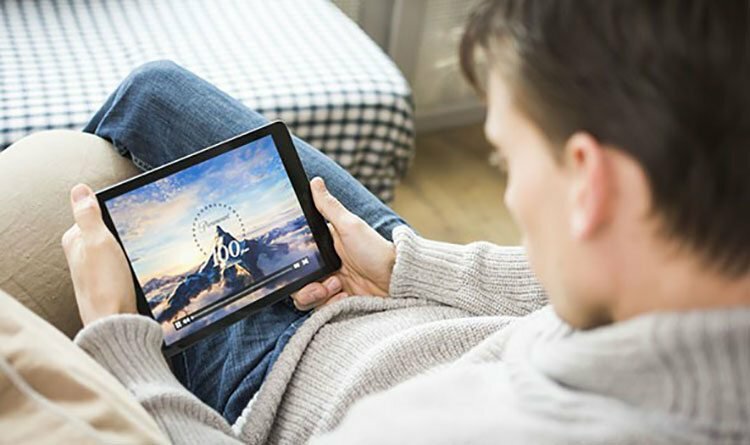 TV2U is utilising a proven business model that is likely to see it generate recurring revenues from subscription and licensing arrangements. TV2U’s revenue sources include managed services – per subscriber, per month or per client download fee, margin on content, margin on personalised advertising uplift, margin on gaming and margin on transit. So impressed was GAL by this revenue generating model, and the potential for imminent, large scale commercialisation, that they instigated the RTO and immediately set out to find complementary partners for TV2U. TV2U provides contract partnering groups a major advantage when using its network and delivery service. This technology differential has been one of the key elements for the partnerships that have been formed by the company over the past three months. And those that are still to be formed. The amount of people using TARA via its partnerships means TV2U can bring down the cost of streaming and make content viable and affordable. TARA can also team up with Indonesian broadcasters for example, take local and regional content, add Hollywood movies and TV and create an Indonesian specific channel for the global market. There is nobody in the world currently doing that. The risks to TV2U are limited because the company is engaged with multiple operators. In essence, TARA offers subscribers and content providers a fast entry to market with low risk. It is a totally scalable technology and as operators expand their service offering, they also expand their revenue generation – and TV2U’s. Furthermore, because TV2U own their analytics platform, costs are further reduced. In fact the cost of the stream to the device is minimal and it’s understood cannot be beaten on price. TV2U has the potential to become a major player in the television streaming industry. One of its biggest differentiators, and the one thing that will help it change the game that Netflix currently dominates in the consumer space, is its cutting-edge data & analytics technology. TV2U is able to monitor more of its customers’ activities in real-time compared to any other streaming service. This added advantage makes TV2U more diversified compared to any other OTT (over the top) and VOD (video on demand) streaming service such as Netflix, You Tube, Apple TV and Foxtel. Let’s use the mobile device industry as an example of how powerful TV2U’s analytics can be. Indonesia, a major market for TV2U, has a population of 248 million. That is 248 million people who could be watching movies or streamed content via a mobile device. With TV2U’s analytics drilling down to minute details such as postcode, potential advertisers can launch specific marketing campaigns to large audiences based on location and personal consumption. TV2U’s analytics are also sophisticated enough to gauge which brand of mobile device and firmware a customer is using. These analytics could be used by telecommunications firms to upsell new phone upgrades and accessory products. Now, that is just one example of a plethora of other monetisation methods that TV2U can deploy in this space given its technology. Essentially, the data TV2U generates on real-time basis can be used in an infinite amount of ways depending on the advertiser’s preferences. This is a huge part of the reason why TV2U is starting to gain traction in a market with over 180 competitors. At the same time, TV2U is still in the very early stages of a tech company’s life – and success is no guarantee here. As a proof of concept, TV2U’s analytics technology was able to double the subscription rate for Nemont TV ’s College Football service – over a single weekend. TV2U can typically improve advertising revenues for companies advertising through its platform by 25-30%. Advertising revenue can be boosted because advertisers are more attracted to the analytics TV2U is able to provide. The end result is that TV2U can share the advertising revenue from specific targeted advertising similar to how Google and Facebook currently do – and we all now how successful those companies have been to date. In just a matter of weeks, GAL is likely to have acquired TV2U and be on the front foot as a pioneer in this evolving industry. In more good news, TV2U recently signed a binding term sheet with Xunity , an Irish-based software developer for internet connected devices and set top box hardware. Via partnership agreements, Xunity has access to an estimated 1.7 million subscribers in the USA and a further 800,000 in Canada. The move comes as North American content seekers, look for alternative and interactive content modes. TARA set top box embedded in all legacy and future Xunity set top boxes. The roll out in North America is expected Q1 2016 – that’s not far too far away now, and its something current GAL shareholders can look forward too. GAL, via the imminent reverse take-over of TV2U, offers excellent exposure to the growing online streaming sector globally, and most importantly in Asia and other emerging economies where its growth is forecast to be strongest. The technology superiority allows TV2U to generate recurring revenue and offers something to advertisers that other solutions don’t. This is likely to assist TV2U in establishing long-standing deals with advertisers that provide lucrative revenue streams.